The representation of lesbian, gay, bisexual, transgender and other non-normative identities in popular media contributes to identity formation and can foster understanding and respect of LGBT+ people in broader society. Nonetheless, televisual portrayals of queer characters often reinforce oppressive ideologies. Some representations of LGBT+ identities exaggerate and demonise queer difference whereas others erase otherness to promote assimilation. 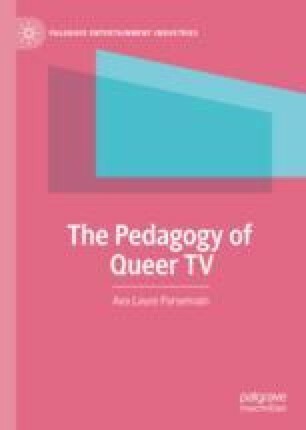 While most of the scholarship focuses on what television teaches about gender and sexual identities, this book explores its pedagogy or how it teaches. To understand how television constructs and disseminates knowledge about queerness and how it can reproduce or disrupt norms of gender and sexuality, it analyses a selection of popular American programmes. Its central argument is that television educates about queerness through entertainment. More specifically, it is argued that entertainment elements like storytelling, melodrama, humour and music, which are primarily designed to provide enjoyment, function as pedagogical tools.